August is Black Cat Appreciation Month. 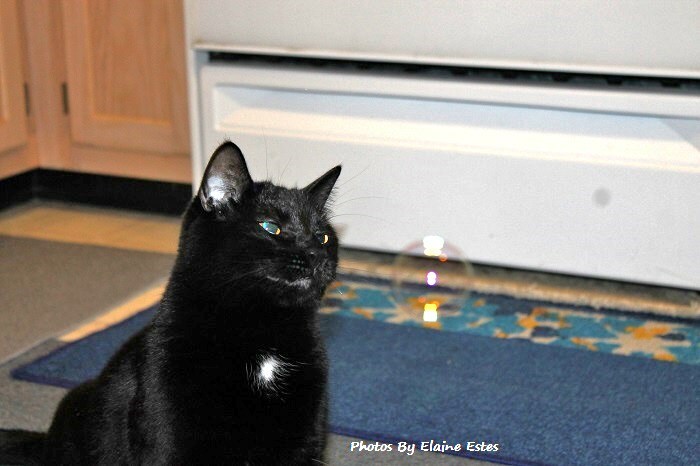 So I am sharing several blogs about my black cat, Norie. Black cats have been maligned for centuries by many people. Foolish superstitions have arisen that black cats bring bad luck; are evil, or are connected to the devil. In honor of my sweet black cat, Norie, I decided some clarification was needed to help dispel these lies and superstitions by showing you how adorable, smart and beautiful my black Norie is. I happen to know from experience that she is not evil! Her name, Norie, comes from the Japanese name Nori, the black algae used to wrap sushi. I am one of the growing number of people who admire and love black cats. (I love all cats but am partial to black ones). Nori belonged to my second son and his wife for her first year of life. They adopted her as a blue eyed baby at a rescue site. She had cat herpes, common to feral cats. This is not like human herpes. It often causes matting of the eyes and potential eye or respiratory infections or blindness without a medicine. When I first saw her I was impressed with her friendliness and playfulness. Then as her personality grew she was curious about everything. She watched her humans as they carried out their day to day routines. My son and his wife medicated and cared for her until she became healthy. After moving from a house to a one bedroom apartment with four pets, they felt overwhelmed with their care and needed some help, I asked if I could have Nori. From previous visits I knew she was a perfect fit for me. When they gave her to me, I had never been owned by a cat, so I had no idea what I was in for until she joined me in my home. I added an “e” to the end of her name for some reason and she became Norie. Neck cone to protect stitches. As soon as possible I got her spayed. She recovered after a week of wearing the “cone” around her neck to protect the stitches and keep her from licking them and dissolving them. I was amazed at how resilient Norie was at adapting to this collar. She had to learn how to jump up on a counter without catching the collar’s edge on the counter’s edge, causing her to fall. She figured that out in two or three tries. Then there was the issue of eating and drinking. The front edge of the cone precluded her mouth reaching the water if approached in the normal way. She figured out to lower the cone’s edge and reach over it to get to the water. Dry food was a bit easier. She scooped up some with the collar, tilted her head back and the food came right to her mouth. Smart cat! Soon life resumed normalcy for her and our lives got even better. Norie has an amazing curiosity. 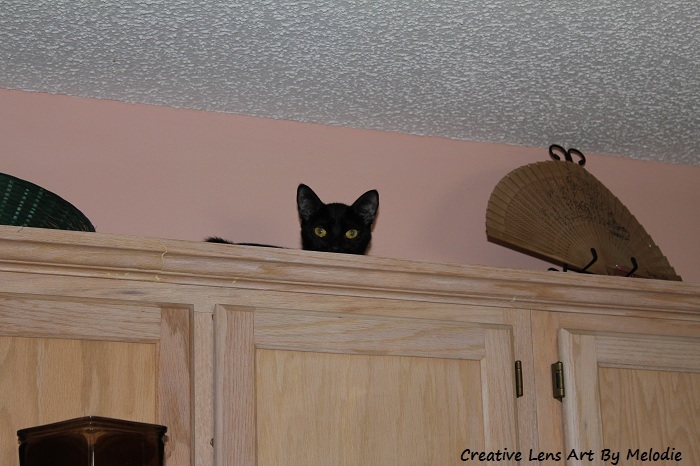 In my old home she jumped from the counter top to the top of the refrigerator and then up on the top of the cabinets around my kitchen. I noticed the care she took to walk between decorative baskets to keep from knocking them down. She would then perch above me and watch as I loaded the dish washer or cooked. Norie seemed to find me as fascinating as I found her to be. Norie can sleep pretty much anywhere. But at night she loves to sleep behind or between my knees, in a little circle. Imagine my surprise when I found out that cats snore! Wonder how many more I can get under the refrigerator. Hoarding is one of Norie’s hobbies. Her eyes light up and she silently meows or gives a little squeak when she sees a straw. In the past she pulled straws out of cups left on the counter at night. Then she stuffed them under the refrigerator along with bottle caps, small shiny things, bread bag ties and anything long and plastic. I saw her reaching under the refrigerator once and assumed she was trying to reach something so I “helped” her. She pushed it right back under the refrigerator. She loves for me to blow bubbles for her and watches with wonder as they float down but then suddenly will pounce on one just right for popping. Should I try to eat it or pop it? At our old home another hobby was to hunt in the garage, her box jungle! She climbed on boxes and the car, and even napped out there sometimes during the day. Now she enjoys our screened in porch and a closer and more personal view of lizards, birds and bugs. Norie is quite a huntress. She’s caught and eaten silverfish, a cricket, a small spider and other bugs. She was delighted to bring in a lizard or two from the garage and even found one, after we moved, on our new screened in porch. Both of them were missing their tails. She didn’t eat them, she just wanted to play with them. Norie can become over-stimulated. I observe her when I am petting her after a few minutes because she tells me she is getting enough petting by switching her tail quickly. I stop and put her back on the floor because I know she is overstimulated. I pay attention to her “stop it!” signs. If I try to pet her after she has signaled me not to, she puts her paw on my hand and pushes it down. I “listen” to her and stop. 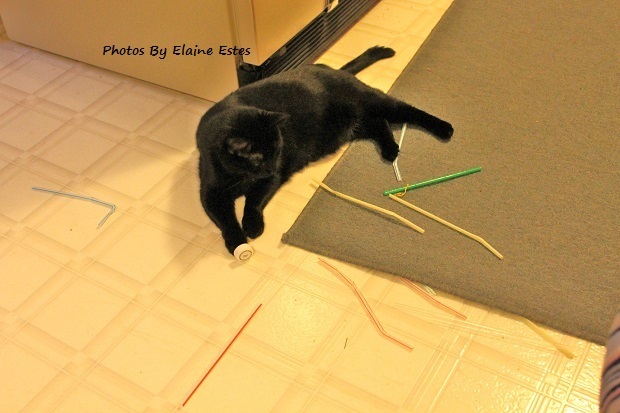 Norie enjoys chasing the laser light, ping pong balls, trying to catch pulled strings, and ribbons. 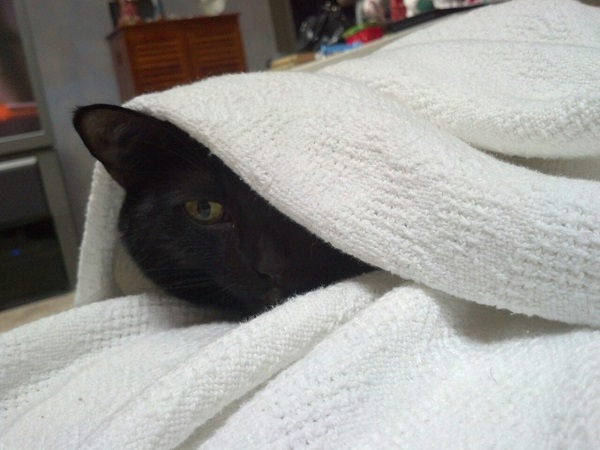 She loves to hide under table cloths, blankets and waits for me to find her unless she falls asleep. If she wants a treat she goes to the cabinet door below the one with the treats and partially opens the door, which shuts quickly with a bang because of the spring mechanism. She does this repeatedly until I leave the room or give her a treat! She also has the most peculiar way of communicating. Sometimes she looks at me and moves her mouth like she is meowing but no sound comes out. I ask her what she wants, tell her to show me and I follow her to the cabinet door for a treat, or the porch or hallway door of our new condominium home, when she needs some exercise. Norie also loves to sit at the top of the stairs in the hall and listen to our neighbors’ television or one elderly couple’s loud discussions because one of them is very hard of hearing. I stay with her when she is in the hall because I want to be sure she doesn’t get into someone’s place to explore. She is having a long and interesting life. Stay tuned for a drug reaction, and feline asthma onset; and more pictures! And some think cats are creepy. They’re the most interesting creatures alive, IMO. I totally agree! I adore my two cats. Thank you for commenting, RB!! They are creepy as hell. (Mine is, anyway.) But that’s why I love them all! How old is your black cat? Mine is now 7 1/2 years old. She hunts bugs when I call, “Norie, a bug!” She is mischievous, playful and just beautiful. Lol, why is your black cat creepy? Mine is also about 7 and a half, & also hunts bugs! It creeps me out when he climbs onto my chest, puts his face into my face & just stares … although he does this to his daddy more than he does to me! Apparently, the over-stimulation you mentioned with Norie is a common thing with black cats. We used to say Tennyson was a 2 stroke cat. Two good pettings and he had his fill. He would stay on your lap if you let him, just didn’t want to be petted anymore. Be careful with razors around the animal. Ours stole my husband’s with blade still in it, while we went away on an overnight camping trip. The razor was shinny, so he wanted it. Eventually found it on a different level of the house underneath the couch! It had been replaced due to needing to shave before the several months of searching was completed. Good news is we never found any cuts on the animals due to the razor. Thank God for thick hair! Norie loves to hoard things under the couch or any door. I am glad to know the overstimulation thing is more common than I thought. I agree, Anna. I have Norie and I have a gray tabby. They both are dear to me. But Norie just has oodles of personality! “I have never been owned by a cat before” <<< LOVE it! LOL. Thank you for sharing! Our kitten showed up climbing on our screen meowing loudly. We live on a corner and thought that someone for sure dumped a litter nearby. Anyway it took my husband pulling out of the driveway in his truck leaving the meowing kitten in the middle of the empty driveway to call me and tell me to bring home kitten food. So much for my husband being the big old bad guy. Big softy! LOL. We didn’t know if we had a boy or a girl she was so young… I got another phone call… my husband said… well, I have good news and bad news… the good news is I found out Tripper (the name another story you can probably figure out) is a girl, the bad news is she just had two kittens under our bed. Oh and yeah!!!! The “IN HEAT” bit… No thanks! Got her fixed right away! 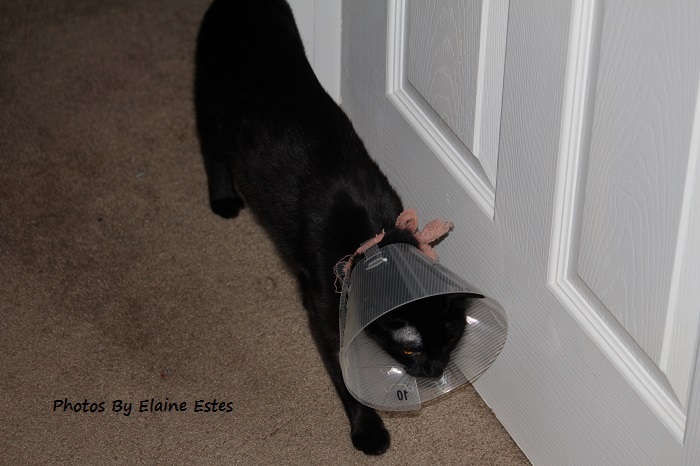 And the cone… that lasted for less than a week! almost 7 years later… she thinks she owns us! Smile. And I am jealous, would love silent meows! They have a way of melting our hearts and leaving their “markings” on us. We are theirs, not the other way around. LOL. So glad you all were lucky enough to find each other!! Your cats are gorgeous! I’ve also got a black cat and I love him to bits. Thank you petraperkov. She is very dear to me. Black cats are special, in my humble opinion. I love black cats, too, & Norie is beautiful. Can’t wait for more updates! Mine isn’t smart 😂. But he’s special! Smart can be a problem.lol. Personality and love is far more important. I love black cat stories. My sisters and I had a lovely black cat called Sooty who lived to her early twenties. We used to take her to the village shop in our doll’s pram! Twenty years old plus? Wow! That is remarkable. Glad you enjoyed this post. I have a poem about my Halloween cat coming out on Halloween. Will definitely read it! Happy Halloween. What a great post…and what a beautiful cat!!! Thank you, colorpencil2014! I thought she was beautiful because I was/am prejudiced. lol. Appreciate the comment!! Thank you. If you are interested in more posts on her, click on cats at the top of the page for more about her and Sister. Thanks. She is a beautiful cat. I could swear Nori was actually smiling in one of your images. I imagine her personality makes her even more precious to you. I love her silky looking coat, and what I suspect is a bit of mystery in her stare. You may almost never hear people making as much fuss over yellow cats, or calico cats, or furry cats, or short-haired cats. It’s the infamous black cat that gets the most press. Fascinating! Thank you so much for your wonderful comments! She is very dear to me and she knows it. LOL. Hugs and thank you again! Beautiful cat. Pleased to meet Norie. Thank you. She is very dear and special to me. She was my very first cat. What? I cannot believe I missed Black Cat Appreciation Month! Oh well, I appreciate my black cat every day and every month. She is hilarious. Norie sounds very intelligent and entertaining. That is what I love about cats. They are so entertaining. You are able to get such great shots of her. It has been a challenge with our black beauty. She just recently started allowing herself to be photographed. I find snapping a good photo of her a challenge. Her sister, no problem. All that black, a problem! Thanks for sharing about Norie! Thank you! Yes, she is smart and lovable. I always wonder if everyone’s black cat is like her. But then they are like people in that each one is an individual. LOL. I appreciate your comments. As far as taking pictures, use a flash or good lighting. It reflects on their black hair and shows the contours of their bodies. Hope that helps. Good to know another black cat lover!! My cat did not like her picture taken so trying to snap a quick one was all that I could do. But she might be a little more open to photos now. I often wonder if other black cats talk as much as my cat. She is a big time talker, her sister not so much. I feel as if Teagan is just talking and telling us things. Nessa only says something when she wants something. Terrepruitt, I have been a photographer for several years. I learned that cats especially do not like the flash on a camera. They have the tapetum lucida behind their retina which reflects light back into the eye giving the light receptors more light to see with. So when we use a lash on the cat it’s a double whammy. I should not have recommended the flash. But perhaps a well lit room or a sunny window may give the same desired effect. If you use your phone for pictures, the flash can be turned off as well. Maybe this will help her let you take pictures of her without shying away if you repeatedly just use ambient light. Hope this helps> Good luck. I rarely use the flash – hence, one reason why I can’t get a good photo. Ya kinda need a flash to light up the features on a black cats face! Thanks. She is just a funny cat. I mentioned somewhere that she wouldn’t even look us in the eye for about the first year! She is goofy! Thank you so much for you ideas!